The past is a shallow grave . . .
Teenager Luke Mullen is missing. Last seen by schoolmates getting into a car with an older woman, it is unclear whether he has disappeared voluntarily or been abducted. Police looking for the boy are pretty certain they are dealing with a kidnap. The son of a former police officer, Luke has no history of being out of touch, no track record of truancy or misbehaviour. And they know that the longer he is missing, the more likely he is to turn up dead. On special assignment to the Kidnap Unit, Detective Inspector Tom Thorne searches desperately for the boy, and for anyone who might have a grudge against him or his family. As someone who had put away a lot of tough villains in his time, Luke’s father is asked to come up with some names. A list is drawn up, but it is the omission which intrigues Thorne – a man who threatened ex-DCI Tony Mullen, served his time, and is now the main suspect in an unsolved murder. Has Mullen simply forgotten the man’s name in the emotional trauma of his son’s disappearance? Or is he hiding something? When the kidnapper demonstrates, shockingly, that he is not afraid to kill, Thorne knows he does not have the luxury of time. He must dig hard and deep into past cases and past lives. He learns that secrets are as easily hidden as bodies, and that even if Luke Mullen is still alive, making assumptions is the quickest way to get him dead and buried. Download the first chapter of Buried. 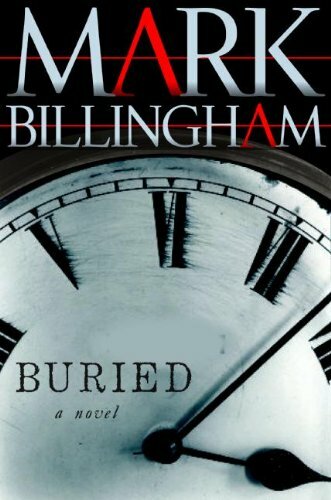 Read the reviews of Buried. To see Mark talking about Buried.